Kohler manufactures a wide variety of gasoline and diesel engines that are commonly used in landscaping equipment. All of Kohler's gasoline engines, including the 15-horsepower model, should be run on 87-octane fuel. It's important to follow the manufacturer's recommended maintenance schedule on your engine to prevent breakdowns. If you find yourself in a situation where your Kohler engine won't start, you can try several troubleshooting steps that may help you pinpoint the problem. Verify that the fuel tank is not empty. 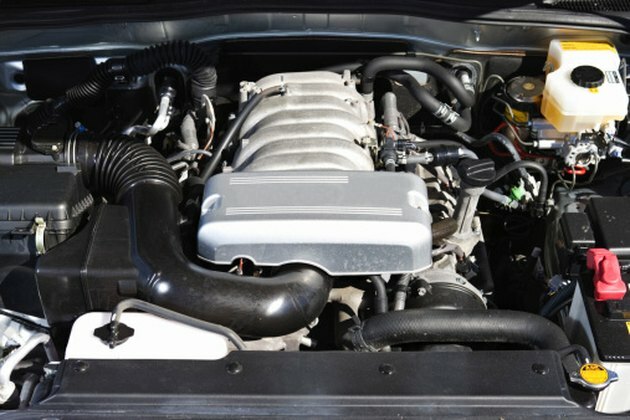 In addition, if you are starting the engine for the first time since last season, drain the fuel tank and put in fresh fuel, as gasoline can go bad over time. Make sure the vent on the gas cap is not blocked, as this may prevent fuel from flowing to the engine. Remove the spark plug using a spark plug wrench and inspect it. If the spark plug tip is excessively dirty, it will not be able to provide adequate spark to the engine to ignite the gasoline. Kohler recommends that the spark plug should be replaced every two years or after 200 hours of use, whichever comes first. Inspect the fuel line to be sure it is not crimped, which can restrict the flow of gasoline to the engine. Check the battery leads if the engine won't crank at all. Make sure the leads are securely connected and free of corrosion. Tighten the leads down with an adjustable wrench if they are loose. If corrosion is corrosion present, remove it using a wire brush. Remove and inspect the air filter. A dirty air filter can prevent adequate airflow that is required to ignite the fuel. Replace the air filter if necessary. Dwight Malone is a journalist who has worked for various Chicago-area newspapers, including the "Chicago Tribune" and "Naperville Sun." He has been a writer, editor and graphic designer since 2000. Malone studied journalism at Eastern Illinois University.